Yikes! Bugs! Giant bugs. Six feet tall. Maybe ten. Just standing there. But, ten-foot bugs don’t have to do much to get your attention. Yep - there they were, posted along the walking paths of the Holden Arboretum in Kirtland, Ohio. I continually marvel at how quickly the heartland’s city dwellers can reach the "country." Unlike we who live in metro areas like New York City or L.A., where retreating to more sylvan environs requires perhaps two hours’ drive or more, folks from places like Cleveland can find farms, fields, woods and wilds in half the time, or less. 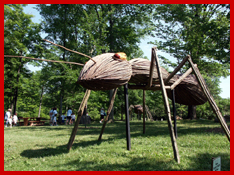 So it was with pleasant surprise that, shortly after departing downtown Cleveland, I found myself encountering Holden Arboretum’s giant bugs. Now, let’s understand. These weren’t real bugs. They were sculptures. Sculptures made from trees and cut saplings. They were placed actual habitats that real bugs would occupy. Starting with a trio of ants "wandering" through the picnic grounds by the Welcome Center. No worries - the day-campers eating their lunch didn’t seemed concerned about those ants stealing their sandwiches. The Big Bug collection is comprised of 10 insects, plus a spider’s web and a bee hive. Strangely, they’re not scary. They’re incredible. Absolutely beautiful, actually. Holden is an expansive place. It covers more than 3500 acres in which are found a huge variety of natural habitats and gardens, much of which is explorable by foot, bike or by tram (a kind of overly-large golf cart). Exciting things are happening here year-round - like the Big Bugs, which were scheduled for display this summer through mid-August - and a variety of guided tours are available. But there’s more to Holden than display. There’s action. Each child who visits during the Big Bug display receives a Discovery Pack and Activity Book. With that in hand, kids can take off on an insect safari, following the "Big Bug Trail" and learning all about these complex creatures. At the end, they may keep the book. And, they receive cool bug trading cards and a book mark that convey nifty bug facts. Like, did you know that lady bugs "squirt bad-tasting liquid from their leg joins when attacked"? Special events are on the docket, too. Such as? A "HillBilly Idol Concert" and "Praying Mantis Weekend". Kids can also explore the "Bee Creative Station," located at the observation tower at Buttonbush Bog, a create-your-own-art stop; or, make like a grasshopper, hunt like a praying mantis, float like a butterfly and climb like a spider at various "Play Stations." While the bugs are only in residence this summer, they’re just a indicator of the kind of surprising and creative action that takes place here, along with a long list of fests and special events. Heck, it’s even a great place to ride your mountain bike or, when the snow falls, to Nordic ski. Okay, I’m not going to lie to you. There’s something odd - almost alarming - about driving past a Wal Mart, or the local shopping mall, and seeing a bunch of horse-and-buggies parked in the lot. But, that’s business as usual in and around Burton, Ohio, home to a large Amish population. The Amish, of course, live simply without electricity or the machines and appliances that we take for granted. Dressed in their traditional simple clothes of dark colors, they travel the roads by horse-drawn buggy, educate their own in old-time country-style schools, and generally live quiet but industrious lives in an 18th century manner. And to think, just hours earlier I was boppin’ and a-strollin’ at the Rock & Roll Hall of Fame. Some 10,000 Amish live in the area that ranges from Middlefield to Mesopotamia, Ohio. It’s the fourth largest Amish settlement in the world and Ohio’s second largest. A stop at the Red Maple Inn, a fine B&B in Burton, led to a get-together with Gordon Safran, inn owner. Although he’s a "Yankee," as the Amish call those outside their realm, Gordon is closely involved with the Amish, and his inn provides information on what to see in the area, as well as driving tour itineraries. "The Amish way is all about family," Gordon said. "They don’t drive cars because cars take people away from their family. The same with planes. They can ride in a car or bus, however." Indeed, he points out, a weekly bus runs from the area to Sarasota, Florida, where many Ohio Amish have relatives. Gordon led a tour around the area. 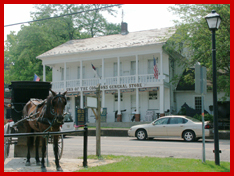 Adjacent to his inn stands Century Village Historical Museum, a collection of buildings and artifacts from every village in Geauga County in which living history is represented. Traveling the area’s two-lane roads, we discussed tourism. Frankly, when I’ve visited areas like like Lancaster, Pa., I’ve always felt uncomfortable; like I was a gawker. Here, however, tourism hasn’t developed to the degree it has in places like Lancaster. A simplicity remains, a purity, if you will, and the locals wave happily at passing tour busses. "The Amish do need tourism," Gordon commented. "Those in this area welcome it. They can’t make it farming these days. In fact, less than ten percent do all farming. Many shops are opening. Once, this was all dairy farms, but there’s no pastureland these days" because, sitting less than a hour from Cleveland, and Youngstown, land prices are continually rising. Along the way, we visited Millers Holtz House Furniture & Quilt Shop where, as we wandered among beautiful handmade furniture, toys, knick-knacks and magnificent quilts, we talked to the proprietor Freeman Miller about the Amish lifestyle. Each church - and there are 80 of them in the county - is overseen by a bishop, and each bishop decides what’s permissible and what’s not. As to courtship - well, it’s old fashioned and it takes a long time. By the time an Amish couple marries, they know each other very well, we’re told, and that’s one reason the divorce rate is very low. At Ridgeview Farm, a combination mini-museum and pick-your-own fruits and veggies spot, owner Sharon Grover has created a small museum in her barn. It’s packed with items that illustrate the Amish way of life. Her farm teaches the farmers’ life. "You’d be amazed how many school children we get here who have no idea where their food comes from." After an hour touring Ridgeview - and maybe picking some fruit - kids gain insight into both how food is grown and something of the Amish lifestyle. Sharon also operates Amish country tours for groups of 20 or more. But, individuals who stop in and find her at home are sure to get some pointers for touring the county. And one stop she’ll tell you to make will be the End of the Commons General Store in Mesopotamia. Wait a minute. Why on earth is this teeny Ohio town called Mesopotamia? Well, of course, it got its name from the original Mesopotamia, which means "between two rivers." In that case, it was the Tigris and Euphrates. In this case, it’s the Cuyahoga and the Grand. End of the Commons General Store owner Ken Schaden bought this place after recovering from cancer and retiring from a high-powered executive’s job with a ladies’ clothing company. When he found "all kinds of antique treasures in the back rooms" - much of it old, unsold store stock going back dozens of years, he, his wife and his 11 kids dug it all out and used it decorate. Old-fashioned toys, gizmos, junk and, well, you name it, hangs from the ceiling and lines walls and the top shelves of Ken’s place, where he sells everything from grocery basics to bulk foods to toys to practical equipment to souvenirs to homemade ice cream. My favorite find: "fartless chili fixin’s." Ohio makes wines? Hey - I’m from New Jersey and even we make wines. Seems like wherever a grape can be grown, wine will be made. Ashatabula County (also known for its covered bridges) is Ohio wine country. The most surprising thing is this: some of these Ohio wines are pretty darned good. Of course, Americans - unlike, say, the French or Germans - don’t bring their kids to wineries to indulge in tastings. But, these boutique wineries offer a lot more than tastings. A peek at the Chalet Debonne Vineyards in Madison, a family-owned and operated estate winery, yielded a good idea of what goes on. Sure, they do tastings. And they do cellar and vineyard tours. But, it’s the weekend entertainment on summer weekends that attracts families. Live music happens Friday evenings and Saturday afternoons. They stage an Ice Wine Festival, an Easter Egg Hunt, the International Culinary Arts & Science Institute Bread Bake-Off, a model airplane day, a hot air balloon rally and something called the Laugh Olympics. Among other events. Nearby in Geneva, the Ferrante Winery has a pretty darned good Italian restaurant. Some 15 wineries dot the area. And about 16 covered bridges. One could easily make a driving tour out of winery and covered bridge spotting. Or, a few local tour companies can organize private, guided tours for you. This is pretty country. Rolling hills, woods, Lake Erie - I was still shaking my head that I was just a stone’s throw from Cleveland. Lodging that night was at Geneva State Park Lodge, set in - you guessed it - Geneva State Park. The lodge is new. The park has a nice beach and some food multi-use recreational trails. And at least one person (me) found it pleasant to sit and watch the sun come up over Lake Erie. But, the state park’s calming effect was soon left behind. Delighted screams could be heard almost before the Geauga Lake - Wildwater Kingdom could be seen. It was a typically hot, humid Ohio summer’s day. What better place to be than a combo amusement/water park? This has not always been a combo park, however. Indeed, it began in 1889 with only a steam powered carousel. It became a Six Flags/Sea World park in 2000. But, a year ago, in a radical move, local owners bought the place, gave it back it’s original name - Geauga Lake - and unveiled plans for a $26 million expansion, featuring Wildwater Kingdom, a 20-acre waterpark on the old Sea World site. Half the waterpark opened this summer; the other half will open next summer. But, in an even more radical move, admission fees were reduced. 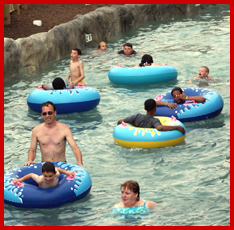 An adult can play all day here for $24.95; kids just $14.95. When’s the last time you heard of a major amusement attraction actually reducing prices? Currently the waterpark lacks much of the huge, killer slides that teens and young adults covet. Well, something called Thunder Falls, is 10 stories high and will move you along at 27-mph, so they say. But, attractions like Splash Landing - a children’s play area with a huge bucket that dumps periodically - keeps younger ones happy. And the teen activity pool comes equipped with net climbs and interactive water sprays where you can "get" your pals. But, on a hot day, just being in the water is good enough. The place was a splash riot as I wandered around. And, next summer will bring a huge wave pool and a slew of new slides. Meanwhile, across the lake (yes, there really is a Geauga Lake) there’s nothing too mild about the amusement park. You can make the transition there either by foot on a boardwalk that shadows the shore, or by paddlewheeler. Some 50 rides dot the landscape, including 10 roller coasters. Okay, I don’t do thrill rides. But, with names like Dominator and Steel Venom, I figure these head-bangers must be okay. There are even a few old-fashioned wooden coasters for those who favor a nostalgic whirl. Judging from the happily dazed smiles on riders’ faces as they came off the coasters, I’d say these rides are up to snuff. Me, I’ll stick to bumper cars and a paddlewheeler sail across the lake. Or, I’ll limit myself to the kiddie ride area, which offered plenty for the small ones to enjoy. I had a flight home to catch. Which reminded me once again: all this country capering really is less than a hour outside downtown Cleveland. Back home, there’s no way I can get out of the New York City environs that fast. No way to combine city and country trips so readily. You’ve gotta like that.